Even if you're not finding yourself at the airport every month, between holidays, work trips, and vacations, most of us travel at least three times a year. And that's enough times to warrant a need for an arsenal of travel wardrobe basics, which is exactly what we're here to help you build. The added bonus of investing in a travel-friendly collection of basics is that while these pieces will save you time and effort when packing for countless trips to come, you'll also wear them on repeat for everyday life. So how did we settle on the 16 basics we highlighted below? It really comes down to smart packing. You want to focus on versatile pieces that can be worn together and that don't easily wrinkle or take up a lot of room in your suitcase. Additionally, you want to pack stylish accessories that will be useful no matter your destination (e.g., walkable heels, timeless sunglasses, and the luggage to put everything in). So without further ado, shop the travel wardrobe basics that will make your life easier for the trip-filled years to come. Having good luggage makes all the difference in the world when it comes to both ease of packing and convenience at the airport. 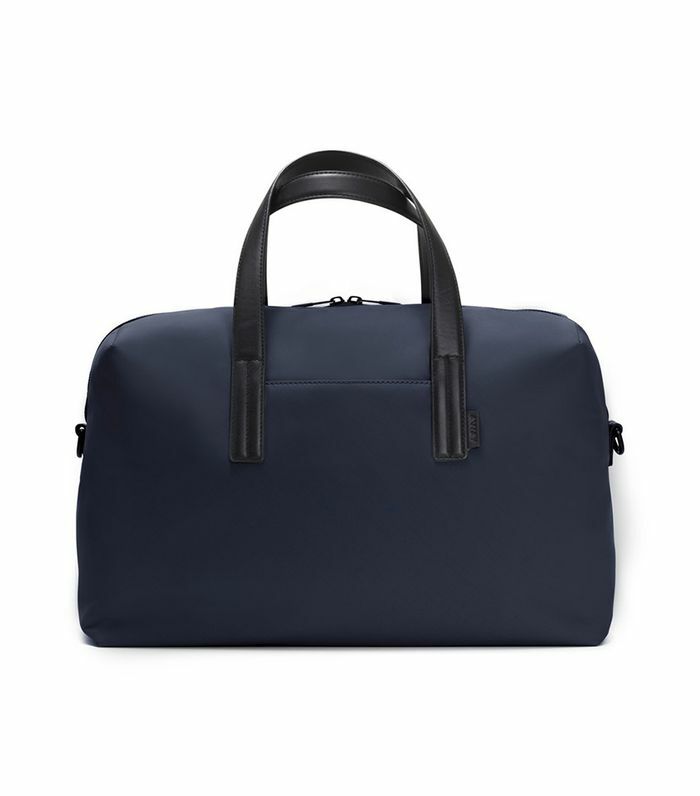 This duffle is the perfect size for carrying on. Part two of that equation is a roomy suitcase that will keep your gear safe (and, in this case, even charge your phone). Comfortable shoes that you can slip off and on while going through security and wear for excursions upon arrival at your destination are a no-brainer. If someone told us to say the first thing that comes to mind when we hear the words "travel jacket," we'd say "trench coat." There's no easier way to add polish to any look. If you invest in sunglasses that are versatile enough (like these), you'll only need to pack one pair. T-shirts take up minimal room, and you can wear them on repeat without anyone noticing. Available in sizes 2XS to 2XL. Take our advice and stock up on Everlane's tee offerings—they're high in quality and low in price. We love vintage-inspired 100% cotton jeans as much as the next fashion girl, but there are plenty of equally stylish stretch jeans on the market, which are far more comfortable. Plan on packing a black pair and a denim pair. Put this ultra-soft set in your carry-on and you may not dread that cross-country flight quite as much. Here's a tip: Lace is a genius fabric to pack, as it doesn't show wrinkles. Try dressing this one down with an oversize checked blazer and flats. It can be tempting to bring your new ring-handle bag, but do yourself a favor and stick to a crossbody (so that your hands will be free for Instagramming). A flattering top that you can wear with jeans and sneakers during the day and trousers and heels for a night out is worth splurging on. As you know, denim jackets are a great layering piece when it's cold, and they are also essential for combatting chilly night air during the warmer months. Plus, it won't take up a lot of space in your suitcase. If you like napping on flights, take our advice and wear a hoodie to pull over your head. It'll help you avoid both disturbances and resting your head directly on the dirty seat. Leave the stilettos at home and stick to block-heeled shoes that you could feasibly walk a mile in. For warm-weather vacations, you'll want to pack a couple pairs of shorts, and we recommend high-waisted, mid-length ones such as these. Staying on schedule when traveling is imperative, so invest in a watch you'll actually want to wear. Even if you're not traveling to somewhere tropical, throw a swimsuit in your bag (even during the winter). You could always come across a very inviting indoor pool or visit a spa. You probably have the urge to go trade in those airline miles right about now. We're right there with you.